This trip was a combination of our two pasts. Karen is of Scottish descent, and Neil is of Scandinavian descent. Neil had wanted to take Karen to Iceland having been there a few years ago and wanting to share such a wonderful place. 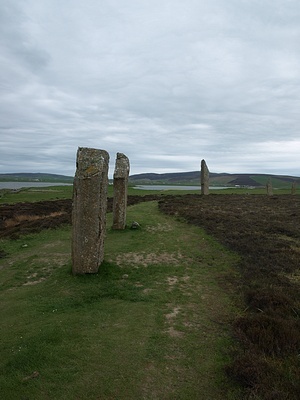 To this base we added our interest in Viking Era history which controlled some of what we saw in Scotland, and our addition of Orkney and Shetland to the itinerary. We had originally planned to get to Iceland from Shetland by ferry via the Faroe Islands, but that link was cancelled so it was not an option, unfortunately. This trip consisted of six main parts, and some thoughts afterward. We took Friday off work to finalize the packing and had Airways Transit pick us up in the afternoon for the run to the airport. 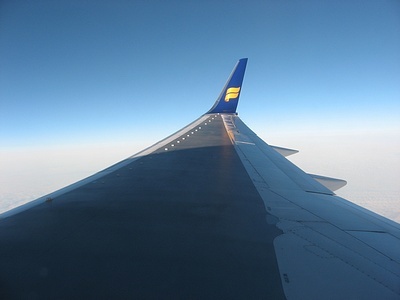 Then we were off to Iceland, on IcelandAir for a quick pit stop on the way to Scotland. This was IcelandAir's first flight out of Toronto, and aside from a couple of startup problems things went smoothly. The 5½ hour flight was pretty rough on both of us. The service was fine, but the seats just do not have enough space. We agree that we would pay more for more space - say 20% ($100-$150) more for a chair that was 20% wider with a little more leg room. We don't need the other "perks" that come with Saga Class (first class on IcelandAir) nor the huge markup that comes with those seats. Just a little more room to breathe. In an interesting twist Icelandair did something like this later in the year. Unfortunately they just don't seem to get it. We were suggesting changing from 6 seats across to 5 in a section, and charging 20% more for those seats. That sort of "upgrade" would appeal to a lot of people. Instead they went to 4 across and made a couple of meaningless changes (seat pitch increased by 1 inch, and the meal is free in these seats). Then instead of charging 50% more for those seats which might have worked - they are charging DOUBLE! Karen occupied herself with her Ipod and thoughts of her garden. We arrived at 6:25 am to be met by the folks at SG Car Rental with our car. 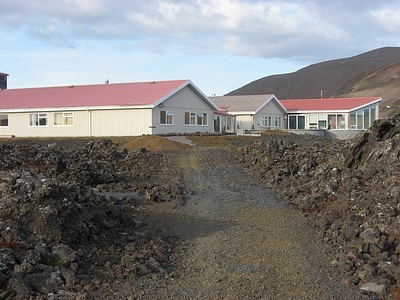 We drove off to the Northern Light Inn, which is a lovely little inn in the middle of a very large, almost empty lava field. The only other thing.next to the hotel is the geothermal plant that brings up water from the Earth's core to power just about everything here in Iceland. Large pipes carry hot water across the country. 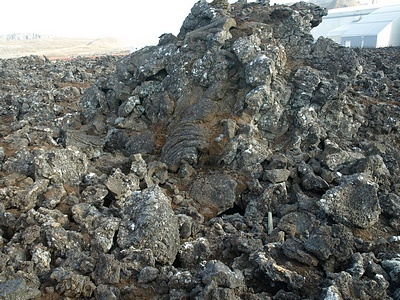 Excess water that is deemed too "cold" was dumped into the nearby lava field. 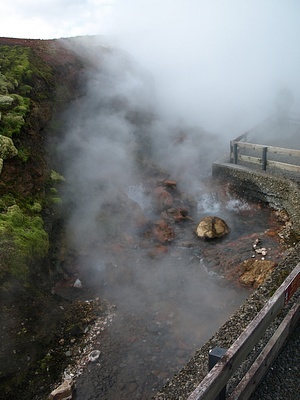 Since it was still quite hot enough for humans to bathe in, people started doing that, and discovered that the mineral salts in the lava field were good for the skin, and the Blue Lagoon was born. In spite of the early hour we were welcomed at the hotel and offered breakfast while they prepped a room for us. Within a hour we were having a short nap. After that it was over to the Blue Lagoon for lunch and a soak in the hot tub temperature waters filled with the theoretically healing mineral salts and algae. The Blue Lagoon rocks for helping you get over jet lag! When we finally dragged ourselves out of the water, we drove down to Grindavik. Then headed back to the hotel for supper. Karen didn't like the way they did the lamb she ordered (too much fat that was difficult to cut off), but the meal was otherwise quite good. 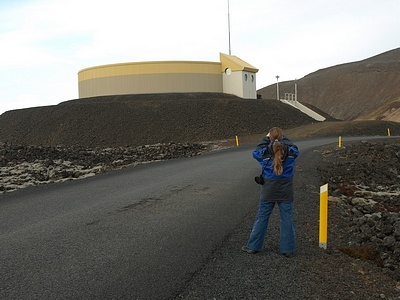 After supper we went for a walk around the lava fields - this building is part of the geothermal plant. Karen likes this picture just because of the way her hair falls. Speaking of hair - while her hair looks really good in this photo, it felt like straw! 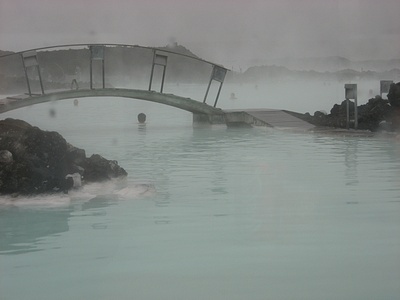 The same mineral salts in the Blue Lagoon that are so good for the skin can play royal havoc with one's hair. Rinse, condition, rinse, condition, and rinse some more - just the very moment that you get out of the water! Despite the restful effects of the Blue Lagoon, we were still in bed fairly early. 5½ hours in a cramped space on a plane during the hours we should have been sleeping is difficult to dismiss. 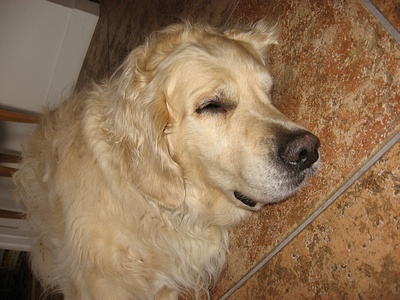 Max belongs to the Northern Light Inn, clearly getting pretty old now but still a nice fellow. Our flight to Glasgow left Keflavak at 5:30pm so we had some time to wander around a bit more. 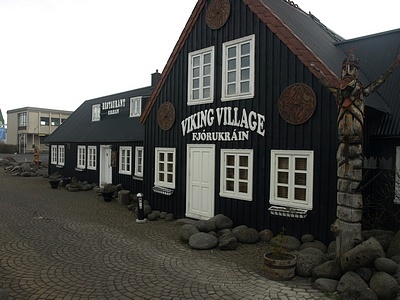 First we went to Hafnarfjordur for lunch at the Viking Village. Neil wanted to get it over with quickly ....let's just say it doesn't have a reputation for accurately portraying the Viking Age, but Karen really loves good schtick. Unfortunately for Karen, the restaurant only does dinners, so we had to go back when we returned at the end of May. Instead, we ate a hot dog (pylsur) and looked at some art near the harbour. 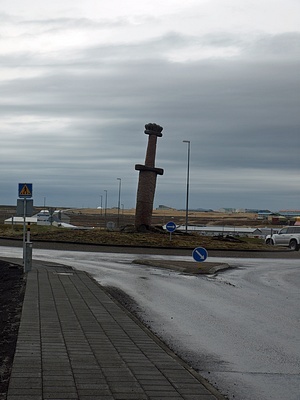 Off to Njarðvík, which is on the way to the airport, where we just tripped upon a Viking ship. It's called the Islendingur and is based on the Gokstad ship. It was built by Gunnar Marel Eggertsson between 1994 and 1996 using proper tools and techniques as much as possible. In 2000 it was sailed to New York with a crew of 9 covering 4200 nautical miles in 110 days. It is 23 metres long 5.25 metres wide with a gross weight of 80 tonnes. The mast is 18 metres and holds a 130 m2 sail. We also found this rather neat bit of mixed Viking and Celtic mythology inspired art in the middle of a roundabout. The sword is a rather large, but decent replica of Viking Era swords, but sticking in a rock like this is classically Arthurian. For our Canadian friends who are just getting used to the things, Iceland is swarming in roundabouts. They really do make the driving so much more efficient. 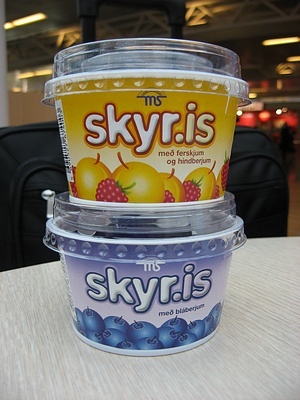 In the airport, we had some more skyr. It really is delicious. It would be nice if we could get it in Canada in a fashion that's easier then ordering it express-couriered from Manitoba. So.....on to a plane and off to Glasgow. We arrived in Glasgow in the late afternoon after a nice (short) flight, and hired a car to take us into Edinburgh. We'd planned to take the train, but the cost proved to be only a tiny bit more, and the cab was much more efficient and direct, and for a bonus the driver was an absolutely delightful travel guide. We checked into the hotel - Ten Hill Place Hotel - which is very conveniently located to the Old Town, and has a lovely bathroom. We woke up today and headed off to the Edinburgh Castle by way of Old Town. At the castle they were just starting to set up for some sort of event just outside the Castle. We tried to figure it out to provide you a link, but without success. 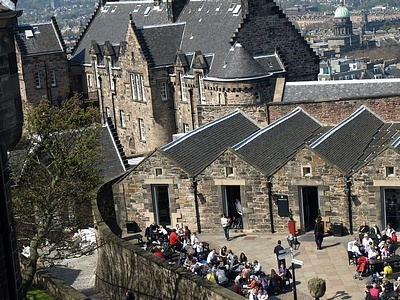 We spent quite a lot of time in the Edinburgh Castle - it's huge. The small buildings in front have been converted to a small restaurant called the RedCoat Cafe. Pleasant enough food. 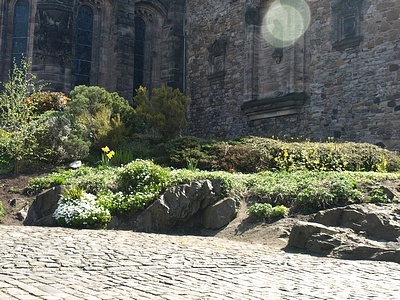 This is one of the gardens inside the castle grounds. You know Karen and flowers, she couldn't resist. 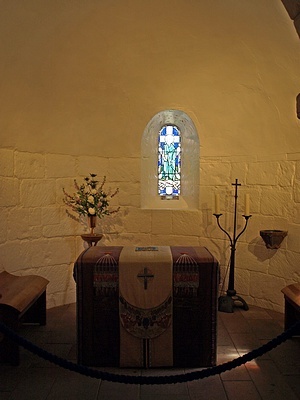 And this is the view inside of St.Margaret's Chapel. It was very.... still. Peaceful. A zillion visitors didn't disturb this tiny sanctuary. The entirity of the castle was quite an impressive fortification. Neil wouldn't have wanted to attack it without automatic weapons... as for muskets it doesn't look easy. They have a really interesting cannon called Mons Meg. Neil had read about cannon built up of welded bands but had never seen one. 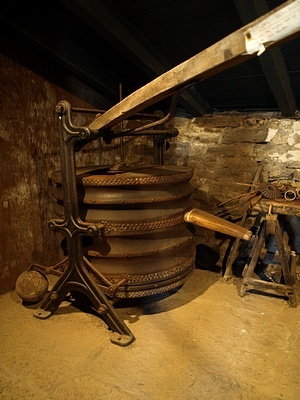 It was delivered in 1457 and used regularly until a band broke in 1681 forcing its retirement. The modern fieldpiece they use to mark various hours just isn't the same. While wandering around old town we also hit the Royal Mile Whiskies shop. A very interesting collection but apparently they have had trouble shipping to Canada. They spoke of having bottles with broken seals being returned rather than delivered. There really should be a legal safe way to import a number of sample bottles. We also stopped at the Scotch Whiskey Experience but at £9.50 per person for a one hour tour with a shot? No thanks. We'll tour a real distillery later. Nice shop on site though. Although we visited the Tartan Weaving Mill it appears that we didn't take any pictures there. Maybe Neil's antipathy towards plaid was subtly influencing Karen's photography. Karen found the whole place a bit disappointing. The place is huge, contains lots of shops, is all about the history of tartans - and all of the displays of weaving are covered in a hefty layer of dust. They also didn't have the family tartan that she wanted in a lady's kilt "off the peg". We'd have to special order it at some large price. Karen considered just bringing the fabric back and staring at it for the next 30 years instead. 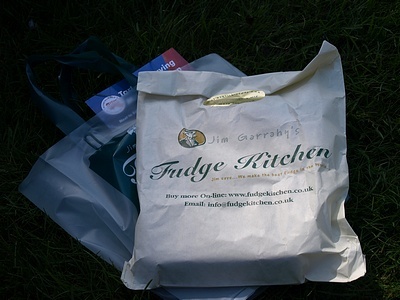 And finally..... of course, there was fudge. :) The fellow who was making the fudge was quite the showman and reminded us both of us of our friend Darrell - also quite a showman when he is out in public. We finished up the afternoon curled up in the park below Edinburgh castle along with thousands of locals enjoying the sun, warmth, and a bank holiday -eating fudge and resting. Tuesday was another day in Edinburgh. The focus was to be the National Museum but before that we stopped at the Elephant House for a late breakfast - good paninis. The Elephant House is the cafe where JK Rowling is reputed to have written most of her first four Harry Potter novels. The museum itself took a while. Over 600 pictures and half a day spent in one exhibit. Yikes. We entered the place around 12:30pm and left..... 4½ hours and some 650 photos later, at closing time. We didn't even get out of the Early Peoples exhibit hall! There were lots and lots and lots.....and lots... of Viking things to photograph. 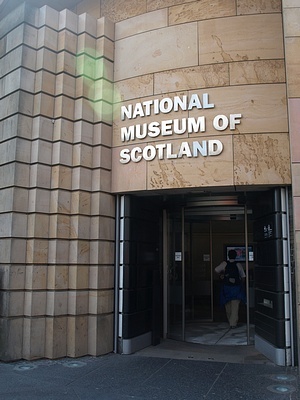 We had other places on the list, but between a long long time at the National Musueum of Scotland and early closing times, we didn't have time for them. Perhaps another time we will visit the National Gallery, Holyrood Palace, Museum on the mound, Royal Botanic Gardens. This morning, we rented a car, got all turned around in Edinburgh on the way out by one way roads, roundabouts, bus and taxi only lanes, narrow roads, and people parking on the street to make the roads even more narrow. Driving on the left was only mildly terrifying as a result. Once out of the city, it was still annoying, but Neil slowly got used to it. Karen was a bit disappointed by Deep Sea World our first stop - a great style of presentation (walk through glass tunnel), but not enough of it for the price. 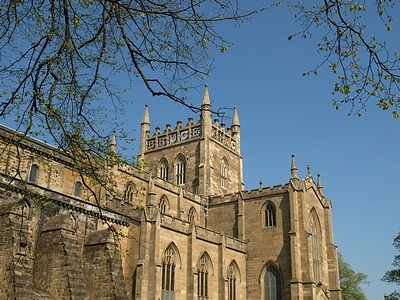 On the other hand, the Dunfermline Abbey was stunning. Karen would gladly have paid the price that Deep Sea World asked, to see the Abbey. Our Historic Friends cards got us in for free - it almost felt like we were ripping them off! The place was beautiful, and felt very..... old and still. 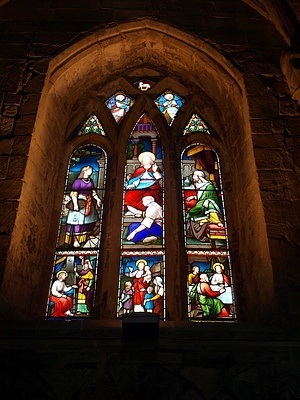 This is just one of the many beautiful stained windows. These stairs were rather tight, and steep! History that you can walk in, and touch. You have to love it. We had planned a stop at the Aberfeldy Distillery but wound up skipping it and tried the scotch in the pub at the Weem Hotel instead. The hotel is about normal but the pub was wonderful. Great salmon, great deserts, awesome sitting room with fireplace while you enjoy the internet, a relaxed night of reading and drinking scotch and cider. According to Neil's notes the Aberfeldy scotch was sharp, with something citrus in the bouquet, and a surprisingly buttery aftertaste. Probably better aged longer. The GlenGoyne was much better smooth, smokey (not peaty) with a hint of chocolate. Thursday began with a trip to the Scottish Crannog Centre. This place was recommended by friends and was well worth the time. The presentation methods were third person costumed interpretors. For those who don't speak museum code, this means that the guides talked about the past as though it was the past, although they were wearing the clothing that the people of the past may have worn. In many museum presentations, costumed guides speak as though they actually are the people of the past - first person interpretation. When the Dark Ages Recreation Company gives a presentation, we often use a mix of both first and third person presentation styles. 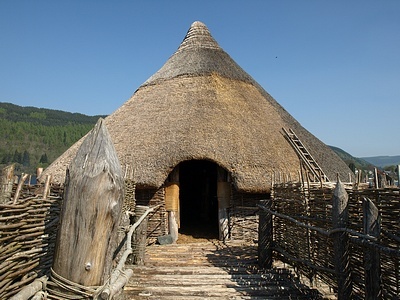 Guides at the Scottish Crannog Centre were very knowledgeable and separated "known" from "believed". The tour begins in the reconstructed crannog with a discussion of daily life. 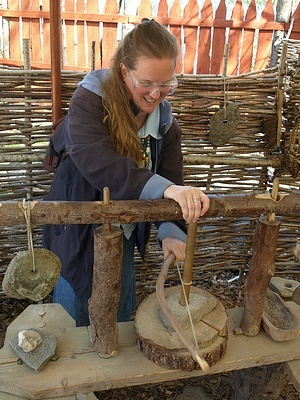 They also had activity centers where you can try a bow lathe, pole late, tension lathe, drop spindles, stone drills, fire starting (bow drill method). Each got a short lecture on "how to" then we moved to the next. When we were done the lectures we were left to play. Crannogs are these things that were set out on the water in lochs all over Scotland in the Iron Age. People lived in them and used the waterways for transportation. It's not really our time period of interest, so we can't give you many details. There is some carry over into the Viking Age however. This is a warp-weighted loom. The guide was careful to say that we don't actually know what kind of loom they used, since we've made no actual discoveries of intact looms, but the same problem exists in the Viking Era as well. Things that might be loom weights have been discovered, and there's a sketch on a Roman vase that looks like a warp-weighted loom (link). 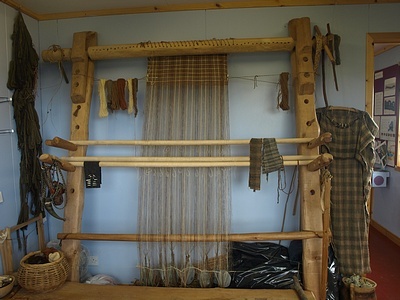 This particular loom hasn't been used since they set up the Crannog centre, some 10 years ago. Pity they don't have a weaver on staff. This was a fantastic place, with great hands-on interpretors/guides and things that we could try out for ourselves. Like this bow-drill..
Next we stopped at the Watermill. It is advertised as a huge bookstore but Neil felt it was a pretty standard bookstore/gallery/coffee shop. Over priced art, decent spread on books. The rest of the day was the drive up to Inverness with a stop at Pitlochry for lunch. Nice little sandwich shop, it is nice to be able to order a venison sandwich. Venison isn't commonly available in Canada. 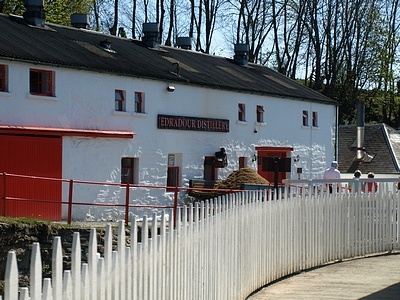 While we were in the area we stopped at the Edradour Distillery. This is the smallest distillery in Scotland we met all three of the guys who work there making scotch - there are more tour guides than scotch makers. Good whiskey though, really good whisky. The 10 year old is a little rough but they have lots that they recask after the 10 years in a wide range of casks. Neil brought home a burgundy casked that is just wonderful, and has taught him that some scotch really does work better with a bit of water. The next stop along the way was at the Tomatin Distillery. The 12 year old is pretty rough but has some interesting flavours.The 18 year old is much better and apparently ages the whole time in sherry casks. We drove some windy narrow roads at decent speeds that often weren't fast enough for the other drivers, and eventually arrived in Inverness at this delightful place called the Trafford Bank Guest House. Lovely rooms and genteel breakfasts in the sunroom, a very helpful hostess, and many modern amenities like Sky TV and Ipod docking stations in the rooms. A softer mattress would have made the place perfect. We spent two nights in Inverness, and the intervening day (Friday) driving around the countryside. We had many plans but weren't able to achieve nearly all of it. Everything closes up shop at 5:30pm so it's often difficult to fit everything in. That's OK though, we quite enjoyed what we did get to see. Neil finds Karen's attachment to things that grow amusing. 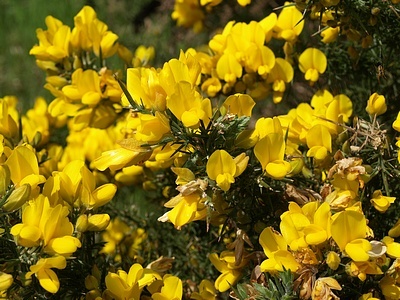 This beautiful burst of colour is growing all over the highlands. 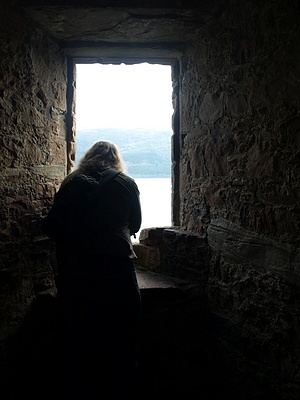 We did get to Urquhart Castle which has a great visitor centre and brief history of the castle before letting you out to see what's left of it for yourselves. As a centre of power, Urquhart is dated back to Columba visiting Picts to convert them to Christianity somewhere in the range of 560 AD. It is not known exactly when the castle itself was built but apparently some records refer to it in the early 1200s, and finally blown up in 1692 to prevent it from being used as a base for the Jacobites. 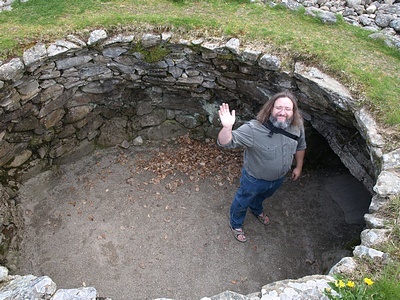 And later in the day, there's Neil again waving up from Corrimony Cairn. Corrimony Cairn is a short distance away from Urqhart Castle. Corrimony Cairn is dated back some 4000 years ago, and is a passage grave in which the bones of just one occupant (probably a woman) were found. There's a circle of small standing stones around it. It's probably the strangest of our historical visits so far - it's just off by itself surrounded by sheep, almost in the middle of nowhere, with no visitor center or staff - just a single information sign. 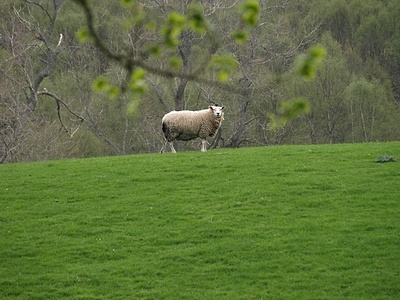 These people - the sheep - are everywhere in Scotland! On hills so steep it's a wonder they don't fall off of them, in little runs just barely on the outskirts of any given town. Everywhere - it's amazing. We also stopped at Tulloch Castle which was once the seat of Karen's clan. It's been converted to a nice hotel in a castle with a small clan reading room out the back. 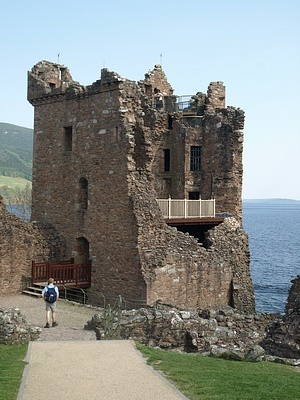 Although the clan apparently still gathers here every few years, it is sadly no longer owned by clan members. 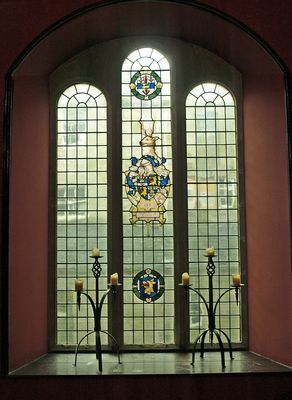 Karen did like this stained glass window with the clan emblem inside the hotel. There was also a stop at the Glen Ord distillery. We learned some important things for scotch drinkers. The round bottle of GlenOrd that Neil currently owns stopped production in 2002. They moved to a square bottle from 2002-2007 which involved a change in strength (up to 44% from 40%) and a shift in the blend increasing the percentage of sherry casked. Then in 2007 they stopped production on GlenOrd. They made a new blend called "singleton" back down at 40% and 50-50 sherry/burgundy casked. Apparently the singleton is only available in the UK and exported to Asia - GlenOrd has moved away from the North American market. A real shame as the Glen Ord is a nice scotch. We never did get to the rest of these places: Cawdor Castle and Gardens, Groam House Museum, Clava, Cromarty Pottery, Tore Art Gallery, Castle Gallery, Logie Gardens, Moniak Winery. Getting to Orkney involved: dropping off a rental car in Inverness, taking a cab to the train station because of course they aren't conveniently located, a train from Inverness to Thurso, a cab to Scrabster (where we sat in a pub for a few hours), got on a ferry, landing at Stromness, had a problem with the car rental agency so we got on a bus to Kirkwall, and took a cab to the Avalon House guest house. Basically, every form of current land travel known to man except farm equipment and rickshaw. With the help of the nice folks at Avalon House we figured out the car rental problem the next day. 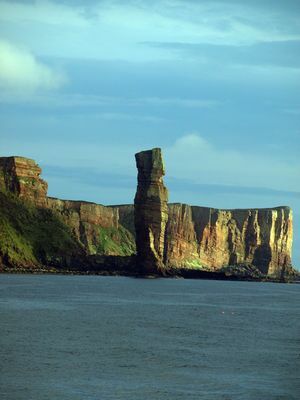 This picture is taken on the ferry on the way into Stromness - it's a famous feature of the Islands known as the Old Man of Hoy. 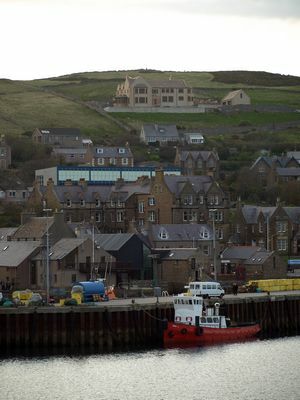 Stromness, from the ferry, on the way in. Today involved getting our rental car (van actually), then spending several hours wandering around downtown Kirkwall with lunch at a lovely little bistro. Then we did some driving around the countryside - the Orkneyinga Saga Centre (which we didn't know existed until we got here), and Earl's Bu and the Orphir Church (which were right beside it). 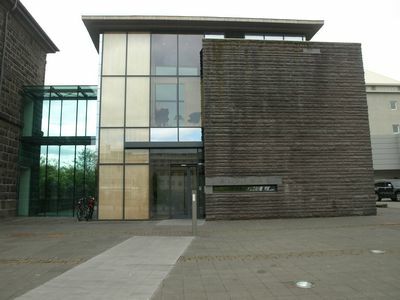 The Saga Centre was very cool. It was 8 panels with printer paper glued to boards and hand drawn titles, plus a little video theatre - it was great, someone clearly cared to tell this part of the story! We also visited the Ring of Brogar, and the Stones of Stenness. It might be hard to reach the mind set of the people who built these things - it was nearly 4000 - 5000 years ago - but if you're at all sensitive to .... let's call it "power" shifts in the universe....it's abundantly clear at the centre of the rings, even as broken down as they are today. This is the Ring of Brogar. 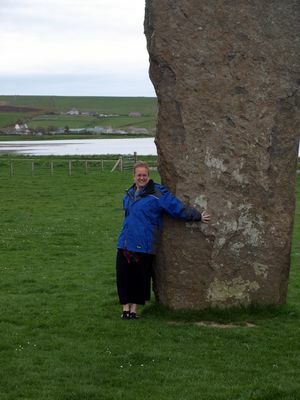 Here's Karen posing with one of the Stones of Stenness. 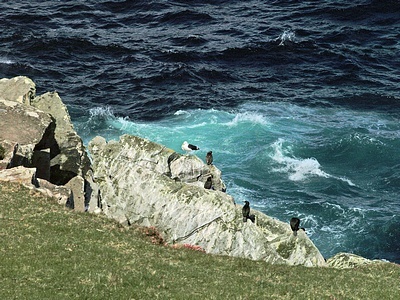 Monday, we got up bright and early and went off to the Brough of Birsay. The Brough is on a tidal island so seeing it is dependant on low tide. And it was fantastic! Lots of the remainders of a Norse settlement - which Karen couldn't quite reach to, but Neil totally could imagine a Norse village and their lives. Watch your step, the crossing to the Brough at low tide is a little slippery with seaweed. We also saw a dead dolphin and a dead fish washed up in a cliff's cleft at low tide. Kind of icky, but part of life. Karen swears the wind was trying to kill her today and spent much of the day finding structures to hide in while continuing to see the sites. 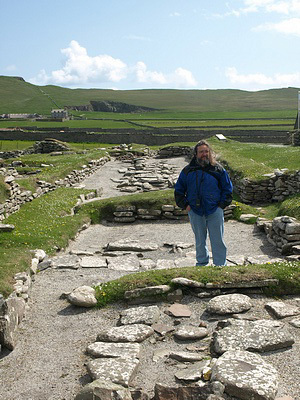 Earl's Palace (15th century, not as interesting for us), Skara Brae and Skail House, and then Maeshowe. 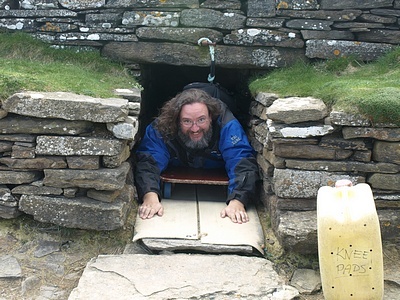 Neil kept finding new kids' Viking books all over this trip - the gift shop at Skara Brae was no exception. Good thing that Historic Scotland card got us a 10% discount at every shop. The gift shop there also had a few other things, which we didn't buy so you'll have to be content with a photo. 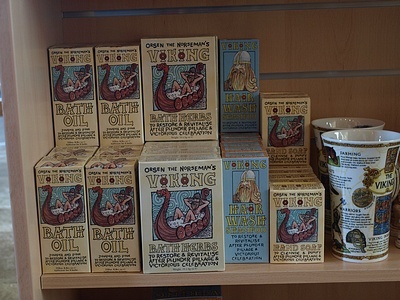 That's right - Viking bath oil, herbs, shampoo.... too funny. 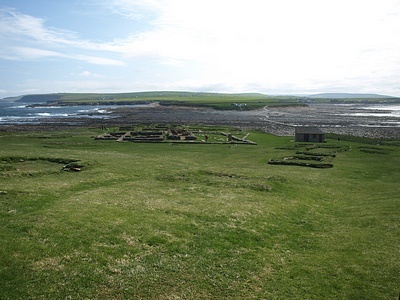 Unlike the picture in the link to Skara Brae, the public is no longer permitted to go into the structures - we must stay on a path around the perimeter. They are starting to become more concerned about preservation of the site. However, they have built a replica of the most detailed house near the visitor's centre and it is quite impressive in itself. Their use of computers in various places to increase your experience with content was also very well done. 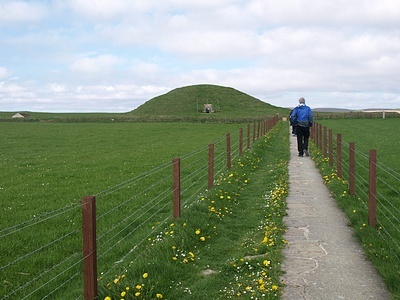 The guide at Maeshowe was absolutely delightful and really brought the place to life. No pictures were allowed inside the tomb but the Viking graffiti was right there, right in front of us. Unlike a lot of examples where you have to squint to make anything out these runes were big and quite obvious. There's a book that we bought that has great photographic plates of every last one of the 41 runic inscriptions found. We bought a lot of them for friends, you have to love the Historic Scotland discount. Neil thought the guide's pronunciation of the original Old Norse of the runic inscriptions and then english translations in a Yorkshire accent was pretty funny. Don't go here if you're claustrophobiac - the entrance walkway is 10m (30 feet) long and only 1m (3 feet) high. 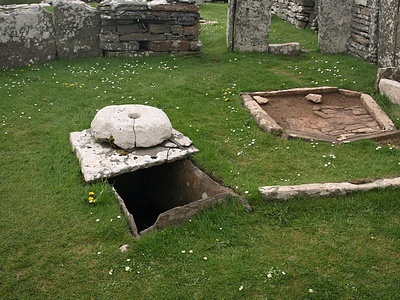 The chamber itself is tiny, and deeply inside a hill. Do go here if you love really _feeling_ history! 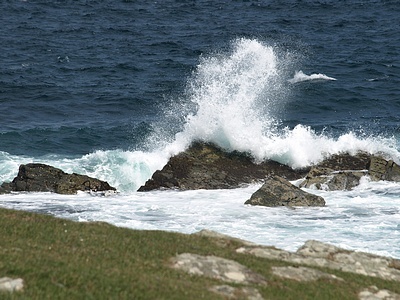 Tuesday involved a drive down to the south end of Orkney. This involves driving across the Churchill Barriers, there isn't much left to see of these ships anymore but before and after photos show the impact the barriers had in terms of silting and changing the landscape and it is odd to see the top of ship rising out of what appears to be a field. 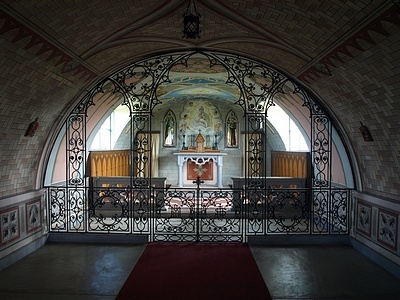 We visited the Italian Chapel. It's not really our thing, but it's story is interesting, and it was pretty enough. It was built by Italian prisoners of war during WW II using only the materials available in camp. After the war it got rather run down and the people of Orkney asked for help to fix it up. One of those same prisoners came back to Orkney to help with the restoration. On our way to the next stop, we came across this Blacksmith's museum in St.Margaret's Hope where we had stopped for lunch. Karen's grandfather was a blacksmith, and one of our closest friends is still a blacksmith. He doesn't use this kind of bellows anymore. :) Overall the museum was sort of sad, it was the shop of a working blacksmith, and when he died they preserved it, but the guide working that day didn't know anything about blacksmithing. Tomb of the Eagles was notable in that it's entrance is only .85 metres (or 33 inches) high. They provide a trolly and a rope for you to lie down on and pull yourself through the doorway. This is another site with a warning to people who suffer from claustrophobia! Unfortunately, it was also our biggest disappointment. It's a privately held site, and is not run by Historic Scotland or any other professional historical society, and it shows. 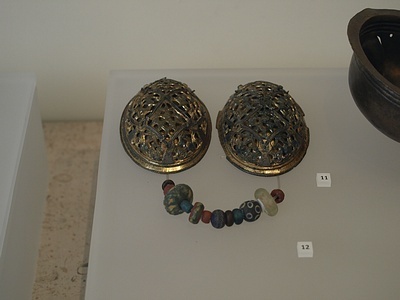 The short version is that we had some difficulty with the interpretation of finds and handling of artefacts. We finished up that day with a visit to the Orkney Marine-Life Aquarium. We expected to find very little, but it was actually a very interesting place! Tons of information, and staffed by the owner who is obviously knowledgeable and cares about her aquatic friends. 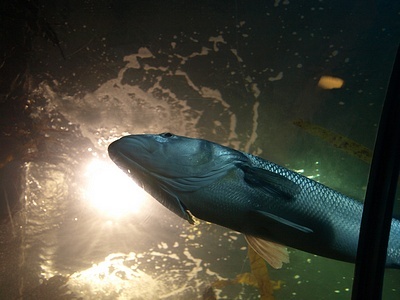 Some of the marine life is actually rotated through the exhibits on a catch, display, and release cycle. It was a pleasant end to a day that was otherwise held some disappointments. Wednesday started off at the Broch of Gurness, which Karen quite enjoyed. Neil had a "shrug" moment. Karen swears she heard him muttering something about "more rocks". It was, not surprisingly, quite windy. Karen quite enjoyed hiding in the remains of the wheelhouses where the wind was completely absent and it was really easy to imagine how the people of the day lived. More stone means more remains. 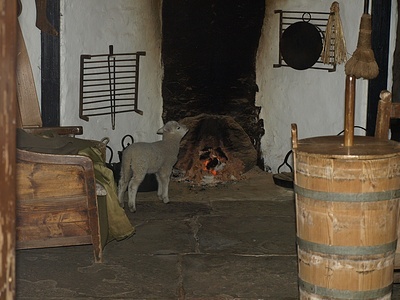 In this picture, we can see the firepit, an oven (hot rocks from the fireplace boiled the water and meat for most meals), and part of a quernstone, used to grind the grain to make bread. Quernstones of some sort follow us into the Viking Age and Karen has quite enjoyed playing with them whenever a historical site has one set up for demonstration. There was also iron ore in the museum but the staff didn't know the provenience. 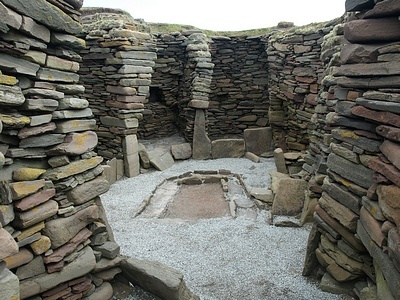 The Broch of Gurness is also the site of one Viking Era burial, near the edge of the entrance to the broch from the sea. 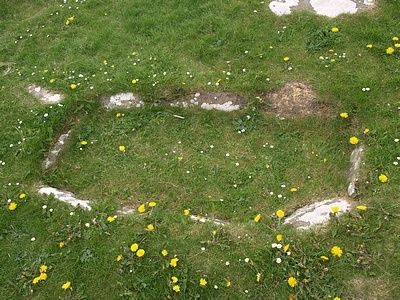 It's unclear whether the Norse used the site for a bit, or just pulled up and buried this woman and then took off again. Minehowe has no pictures. Karen couldn't get the picture that someone else did on the Undiscovered Scotland site. 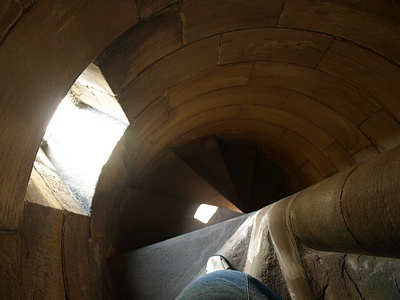 It's just 29 steps down into the earth - yet another site that is not for the claustrophobic. They give you hard hats when you go out to climb down the steps. At the bottom of the steps, there is enough room for two people and that's it. Neil enjoyed talking to the staff here - it's apparent that archaeology on the site is still in it's early stages. There was also an iron smelting site found in a part of the surrounding ditch. We also stopped at the Highland Park Distillery which was under reconstruction so no tour and not much of a visitor centre but Neil still picked up a bottle or three. Then it was off to Stromness, a small town with some fun shops. We visited a scuba shop, and almost bought Darrell a viking diving hood (they call it "devil with no tail" but what do they know). Unfortunately they didn't have the right size in stock. 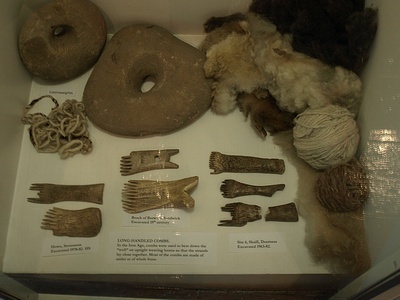 Then we looked into the Stromness Museum which is three small rooms crammed with local memorabilia and a victorian natural history museum upstairs . Orkney also has a Craft Tour which we had been visiting off and on over the last few days. Today we stopped at Sheila Fleet and Jane Glue. Dinner included a lamb stew with sheep from North Ronaldsay, Shetland. Apparently they take their sheep quite seriously in North Ronaldsay - they are fenced _away_ from the grass on the land and eat seaweed on the beaches instead. Those with experience and discerning palates convey the idea that this significantly changes the taste of the meat. Karen tried it, and didn't notice the difference. Mind you, she doesn't have a great deal of experience with eating sheep. Our last day in Orkney was long and annoying - timing is everything. We had to leave the hotel by 10am and weren't able to board the ferry until 11pm. We couldn't even check in the luggage until after 9pm. And we had to give up the rental van by 11:30am. So....all day in downtown Kirkwall with luggage in hand. We asked around and discovered that Bob's Taxi would store the luggage. They call it "left luggage". That was great, and we used them to get to the ferry terminal at night. Then we just had to entertain ourselves in Kirkwall for.... oh... 10 hours or so. There was an hour in the post office shipping back two weeks worth of finding new books in Scotland. We shall not mention that episode again. There was lunch to be had, and some history to explore. 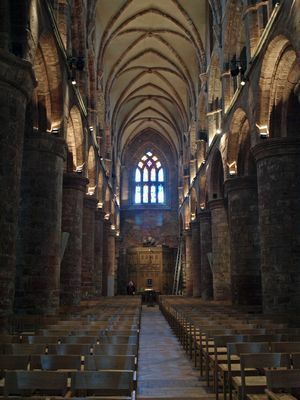 We wandered around downtown again, stopping at St.Magnus Cathedral. This place was interesting in that it's architecture is very similar to the Dunfermline Abbey but the entire cathedral is still in use. The modern lighting that has been added made it very difficult to take a good picture of the interior - thank goodness for photo editing software. It is NOT Viking era as you may continually read in many promotional literature, but it may have been influenced by later period Norse earls in Orkney. 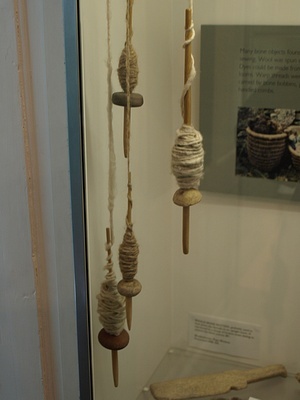 The Orkney Museum had a few interesting things from the many different archaeological sites on the islands although Karen isn't sure that she liked their presentation of the use of drop spindles. It is more then amply possible to spin consistent fine yarn on these things - she has done it. This is just ....in incredibly poor taste. And in this picture.... both of the stones with holes in the middle are listed as loom weights but Karen doubts it. The one on the right is simply far too large and heavy. I'd be more prone to believing that it's a small quernstone. Shopping happened, some gifts might have been bought. And still.... we had more time to kill. Then there was a pub, and it was only Thursday so not a big party scene... we listened to the locals play bingo. Perhaps we should have joined in. And then finally, there was the ferry. Straight into the room, which was _small_ with twin beds. It was a surprisingly sound sleep, given the ridiculously hard bed and no husband to fight over the bed covers with, but still, too short. The captain work us all up at 6:30am to prepare to arrive in Lerwick. The ferry arrives at 7:30am, which is before most car rental companies open, and way too early to check into the hotel. Thankfully Star car rentals was willing to meet us early so we could leave the luggage in the car until we could pick up the keys for the Brentham House. Fortunately, they were fairly agreeable - they only wanted us to wait long enough for their housekeeper to make sure the space was clean. We stayed in the Brentham House which turned out to be a much nicer place than we had thought - 4 rooms instead of the usual two rooms. In addition to bed and bath, there was also a living room and kitchen. And all of them were BIG. Its a radical change from the previous night on the ferry where we had to dance to change places between the beds. Even being over a pub on Saturday night wasn't too big a problem, and they did warn us before they accepted the booking which was very nice. And speaking of that kitchen, Karen promptly went grocery shopping and we ended up having Kraft Dinner for supper - comfort food. We did have a bit of time before we could get into the Brentham House, and we filled it with a visit to the Shetland Museum & Archive, which was just around the corner in Lerwick. This is a great new museum with some really interesting stuff. 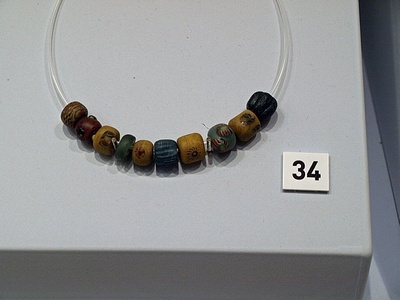 Really only 1.5 cases of viking era stuff like these beads, from a find at Northmavine, Shetland but unlike both the National Museum of Scotland and the Orkney Museum, this place had artefact numbers easily available! This gold ring is what Neil used as his guide when he went to a jeweller to say "make something like this with diamonds in it so I can propose to my chick". It's from a find at Marrister on Whalsay in Shetland. 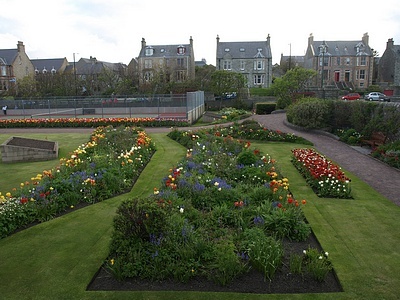 Lerwick also has this lovely garden in the middle of town. 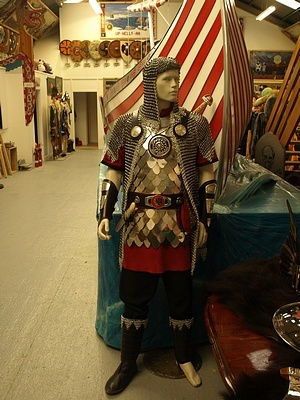 This is the outfit used in January 2008 by Up Helly Aa's Guizer Jarl (parade chief), Roy Leask. He was representing a later era saga figure Kol Kolison. We actually met Roy when we toured the Up Helly Aa exhibition shed - he's an interesting guy. He reminded Karen a lot of the chief librarian at her library. The short version of describing Up Helly Aa is that it is.... a world apart from actual Viking Era history. It grew out of the Victorian Era, which has done many strange things to Viking history. If you think of the festival as Living History, you need to think of it as living _Victorian_ history. 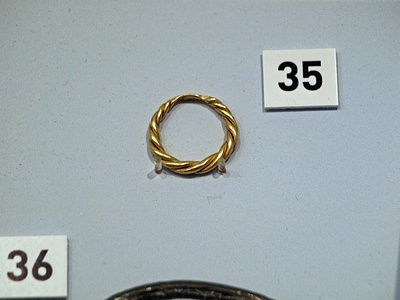 In Shetland, the biggest site of Viking Era findings is at Jarlshof. Jarlshof is a multi-use site, meaning that it was continuously occupied over thousands of years and several different cultures from the Stone Age, Bronze Age, Iron Age, Pictish, Norse and Medieval eras, right the way through to the 1600s. Its pretty hard to make sense of the walls as it was rebuilt so many times. Still a neat place. 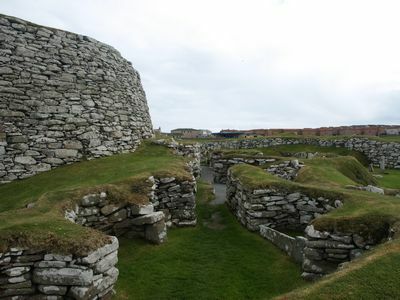 Again, Karen found herself more drawn to the wheelhouses and brochs of two thousand years ago then the Viking Era Norse houses that remain here. The audio tour they provided also gave some decent background as you walked around (at your own pace) whch was nice and we enjoyed the fact that it had both a shorter version for walking around as well as extended information that you could hear if you wanted. Neil, of course, remains attracted to the Viking Era side of things. He's standing in the middle of the longest of the longhouses found here. Perhaps it was the community hall, or just the home of the wealthiest farmer in the area. Karen continued to find sheep that wanted to have their picture taken. This youngster was quietly semi-sleeping, having finally filled her belly. 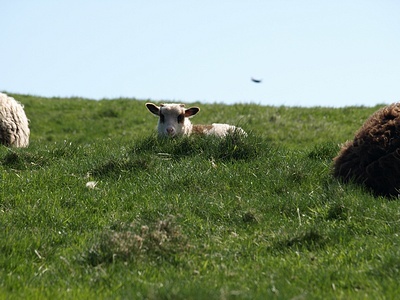 That's all the sheep seem to do - eat grass and sleep. Don't you just want to take her home and .... shave her repeatedly over several years for the wool? This lamb has a different story. She's just a couple weeks old and was found wandering by the fellow who was staffing the Shetland Crofthouse Museum. He's been hand-raising her, and needs to feed her four times a day. She follows him around everywhere so he takes her to work too, where we found her warming herself by the peat fire inside the Crofthouse. 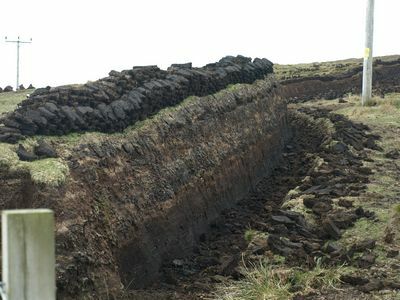 Neil says the crofthouse reminded him a lot of the sod houses in the early Canadian west except for the stone construction. 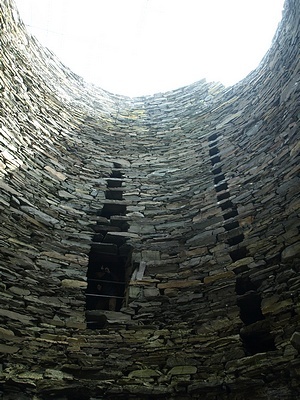 Imagine sailing around the Shetland Islands in the later centuries BC, and coming across this imposing feature. It says "powerful people live here". And it's still standing today, sufficiently intact that you can take the interior steps all the way to the top, where you can see the landscape for miles all around. It's the only remains of it's kind in this good a condition, largely because of it's remote location. The island of Mousa is currently unoccupied, except by the inevitable sheep and many other forms of wildlife. 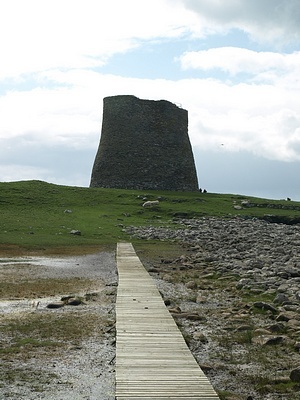 Mousa Broch stands an imposing 13 metres (43 feet) high on the landscape. It has two walls - both quite thick in themselves, with an interior staircase running between them for stability and access to the top. At it's base, the outside width is 15 metres (50 feet) across, but it's interior width is only 6 metres (20 feet). It's thought that there were wooden floors at different heights, somewhat like balconies, to increase the living space, but nothing of wood remains. If there was a community of smaller houses around the site, they have not yet been uncovered. Strangely enough, no one has undertaken an archaeological dig here. The island of Mousa is also a nature preserve. We did the entire circular walk (about a mile and a half), and spent some time trying to capture the various wildlife we could see. These are the two shots Karen was happiest with - we need a larger lens for the camera! We saw seals, and tons of different kinds of birds. We're not birders, by any means, but Karen did spend some time trying to catch the birds in flight. Sadly, "in flight" didn't work out. And finally, we conclude with Old Scatness Broch. Neil calls this our most surprising find yet. Yet another Broch? Well....yes. But it's still being dug, and pieced together for the tourists to visit, and staffed with a very strong interpretive program (3rd person in costumes like the Scottish Crannog centre). They say there should be a publication in a about a year - the volume is about ready for the edit stage now. Very enthusiastic people who really know their stuff, some of whom double as students in the archaeological program at the University of Bradford, which conducts the digs. 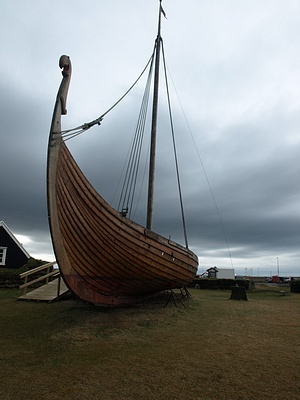 They also mentioned that there is evidence that Viking Era Norse occupied the site for some time. Viking enthusiasts will eagerly be awaiting the publications associated with this site. Unfortunately for Karen, the weaver had the day off, but Karen looked through her stuff and was quite impressed by the work she's done on the loom. The dress to the right of the loom was made on her loom. It was fun walking through the site before it is finished, sandbags set up in many places to stabilize it, tarps covering some of the active investigation areas. Karen found a drop spindle in the Old Scatness Broch gift shop so she could spin the North Ronaldsay rovings that she'd picked up in Orkney! The North Ronaldsay people seem to be the only ones who understand that hand spinners still exist. 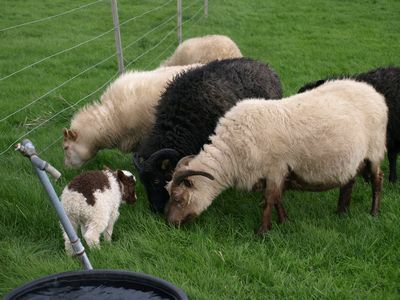 In Shetland in general, Karen found very little in the way of wool available for spinning. While there's a huge knitwear industry in Shetland, it seems that most of the wool goes straight to commercial mills for industrial spinning, with a little made available for felting crafts. What's made available to crafters for felting isn't usually suitable for spinning - it's already semi-felted. A quiet day today with a trip north through the countryside. We saw some active peat cuttings which was interesting and we got to the Weisdale Mill which was a waste of time. The website we found about this was out of date there is no textile museum anymore. Two single room art galleries filled with original art that .....well, didn't really turn our cranks. The drive in the country was nice 'though. We stopped at Tingwall to look at the Viking site there. They are missing a key point when they call "Ting Holm" - a small island at the end of a very narrow causeway - the "meeting place" and mention that it would have been windy and "small" for a meeting. They missed the idea that it was the place where perhaps disputes were settled? 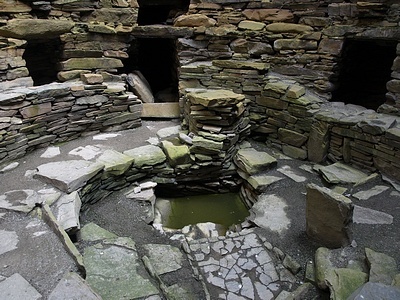 We also visited Clickiminn Broch, which is literally right on the edge of Lerwick. Neil thinks it would be cool to live in a town with a 2000 year old building on one side. It is in pretty good shape too although not as tall as Mousa Broch. Karen hit her head pretty decently on a window sill and whimpered like a girl for a few minutes. Our last day on Shetland involved a stop at Jamieson & Smith Wool Brokers, where Karen picked up a big ball of black Shetland rovings, and Fort Charlotte. This was a 1600s/1700s harbour fort. Neat enough, apparently still in use, also being touched up on one wall which limited some of our access, still since it was across the street from the hotel we just had to stop in and wander around. 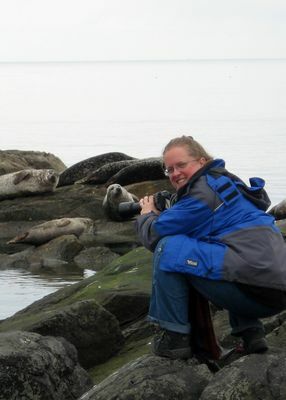 We also spent some time watching the seals in the harbour - Karen got some great pics and Neil managed a couple of "national geographic" type "here the intrepid photographer approaches within 50 feet of the seals" pictures. A liitle more shopping, some more fudge (not as good as the Orkney fudge) and then it was time to board the Ferry to Aberdeen for yet another smooth trip in the north atlantic. Thank you Thor! Today was just about the car rental and driving back to Glasgow for the flight to Iceland. A nice quiet drive in the country including a stop at Stirling Castle. They are putting a lot of effort into reconstruction at this castle. They've rebuilt the great hall and they have full-time weavers recreating several tapestries that used to hang in the great hall. Totally not Viking Era stuff, but the tapestries were wonderful. They've built a small tapestry weaving studio inside the castle and are employing full time weavers to get it done. Three of the seven tapestries have been completed. They are currently in the middle of the fourth tapestry and the weaver's shed is open to the public but it's a little frustrating. There are signs asking the public not to speak to the weavers because the work requires concentration, and we're not allowed to take photos. Not that anyone other then the rule-oriented Canadians obeyed either request. And Karen wanted to do both photos and conversation! 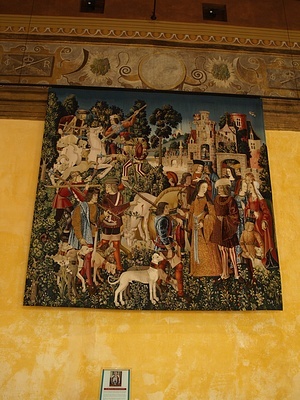 Here's one of the finished tapestries that is now hanging in the great hall. We spent the night in the Ashtree House Hotel, a 200 year old Georgan house redone as a small hotel/guest house. It's located up a nearly dead end street beside a church/cemetary and right near the museum (which we missed due to the hours). Nice dinner at a little bistro, a reasonable night's sleep and then a fast trip to the airport. Arrived in Keflavik easily enough - Scotland to Iceland is a short, pleasant trip by air. We anticipated a bit of a problem at the airport, because Neil had picked up an awful lot of scotch during our weeks in Scotland. We needed to convince the Icelandic authorities that we were planning on taking it all home with us to Canada when we left Iceland eight days later. 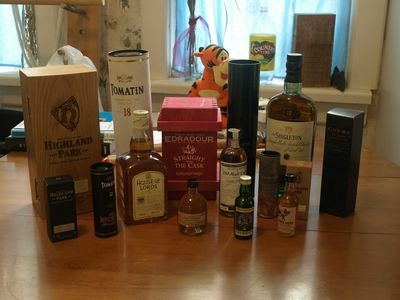 They made it very easy for us - volunteering to store the scotch in the airport until our departure. Let's see - lighter suitcases and no more paperwork then a receipt for storage? Very nice! Neil came away looking like a cat who had just licked the last of the cream. We settled into our digs at the Guesthouse Eirikur Raudi then wandered out for a look around the city. We went up to the bell tower of Hallgrimskirkja, which was right next door to us. It's the tallest building on the horizon in the city, so if we ever got turned around in the city, it was easy to find our way home. This is a photo of the guesthouse from the top of the bell tower. Our host is up on the ladder, probably cleaning the upstairs window. We wandered around the city for a bit and had a delightful dinner at a place called the Tivoli. Karen had a brief strange reaction to the language - for all that Icelandic and English share common germanic roots, they are nothing alike! The simplest words are long and convoluted - every street sign and business sounded like so much garble to her ears. It was an easy enough adjustment to make 'though - a good night's sleep - and Karen was back to inquisitive enjoyment early the next day. The guesthouse is a nice enough place. Good people, great bread. 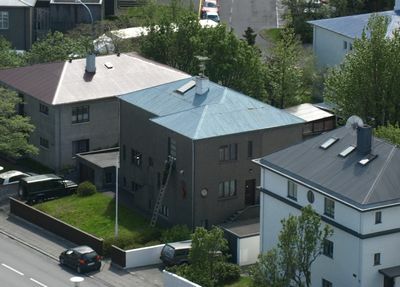 Basement rooms but with great windows and smart people that provided both shades and curtains, which is necessary for Iceland in the summer. Well insulated from outside sounds, not so much from other rooms. Neil says he'd call it very good value for the krona. On friday, we hit some highlights in Reykjavik - the Reykjavik 871±2 exhibit, the National Museum, Artsfest (all around us), and the Saga Museum at the Perlan. The Reykjavik 871±2 exhibit is very new. When the Hotel Centrum demolished an old building in the heart of the city to build a new hotel, they discovered the remains of a Viking longhouse under it's foundations. 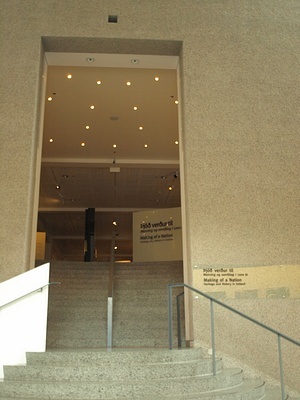 In 2006, the exhibit opened under the hotel. The stone walls of the Viking longhouse are still there, but they are difficult to photograph. The lighting is very low level in the exhibition. This is mostly to accentuate the high tech stuff they use around the foundations. They have these neat little mini-screens around the walls that are motion activated. When you get near one, it turns on - this one has a ghostly blacksmith pounding on his anvil. 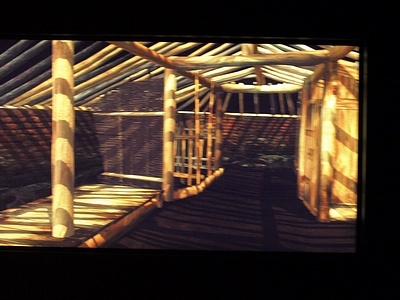 There is an interactive computer screen that takes you through what a longhouse might have looked like and how it was constructed. You create the different sections of construction as you move your finger around the control panel. 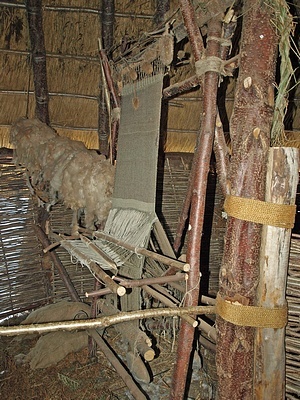 There were also computer touch screens with more conventional written texts on genealogy, the evolution of the language, foodstuffs, animals and textiles in the Viking Age. 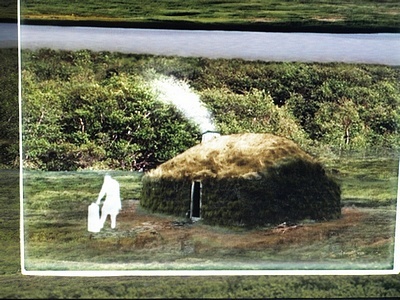 There were some artefacts in display boxes, and also an interactive computer table model of the longhouse. Overall, decently impressive but unexpectedly high tech for the Viking Age. The "how we made this museum" exhibit was also a nice addition. The National Museum, on the other hand was rather disappointing, mostly because they didn't allow any photos. This is the only picture they would allow us to take. Just inside the front door. The building is quite impressive architecture, but it's the contents that most visitors want to remember. No photos allowed, no artefact numbers in the display cases, very little significant information on any given piece. The museum text was written to provide context, without specific details, so it's difficult for the average visitor to feel particularily engaged. Neil's experience with emailing the curator before the trip indicates that this may be a good research museum when you get out of the public areas. The response was fast, friendly and open. However the public space is almost waste of time for a serious researcher of the Viking Era. There were some computer touch screens that provided more info but that was hit and miss as well - some were good, some were very light weight. Some cases were actually so poorly lighted (like the textiles) that you couldn't really make out the details like weave type. Neil would also say that for the casual visitor this is a great place. Allow yourself 2-4 hours, depending on the breadth of your interests, and you will pick up the basics of Iceland's history. In Iceland, there's approximately 1 public pool for every 2,000 citizens. The average citizen uses 1 tonne of hot water every day. Everyone swims or sits in a hot pot almost every day. In Waterloo, that would equate to almost 60 public pools. There are exactly 4, if you include the pools at the two Universities, and the one that is only open in the summer. 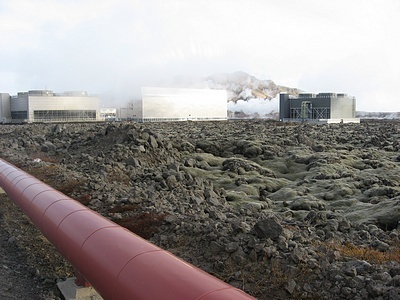 Geothermal energy is violently abundant and _cheap_ here. It costs them to _cool_ the water, not to heat it. The Sundhöll reykjavíkur is just around the corner from the guesthouse that we stayed in. Winding down a long day like this with a soak in the hot pot is very civilized. 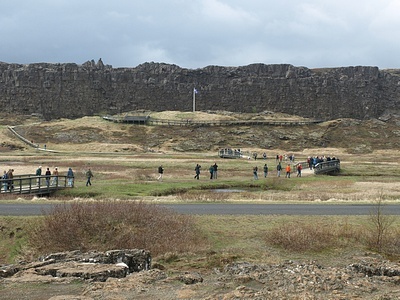 On saturday we went on the Golden Circle tour of Iceland offered by Reykjavik Excursions. This is Neil's choice for anyone's first introduction to Iceland. It's a bus tour of some of the main sights outside of town, with a guide to help describe the areas. The first stop was the greenhouse town, Hveragerði, which makes a nice break to stretch but isn't really all that special. 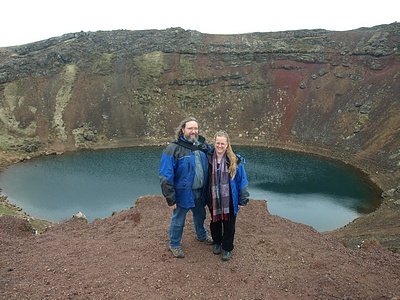 Then comes Kerið - a six thousand year old extinct volcano crater with a lake in the middle. Some tourist types got caught on film, together even. It is very hard to convery the huge scale of this place or the colours of the earth surrounding the crater. 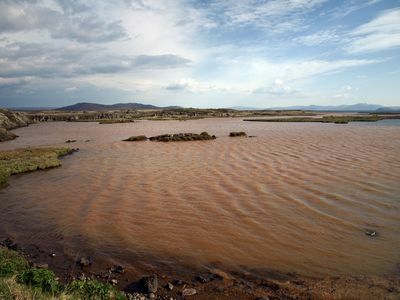 The water is approximately 55 m (180 ft) beneath us, the crater 170 m (560 ft) wide, and 270 m (890 ft) across. 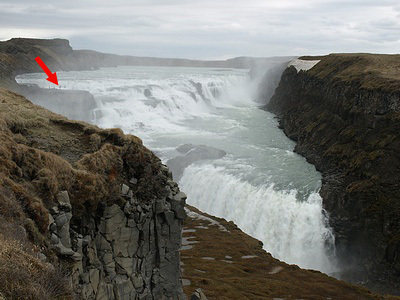 Gullfoss is their "Queen" of waterfalls, tumbling down a deep gorge. It's hard to describe or even understand Iceland sometimes - this waterfall is a good example. Karen took lots of pictures of it and this is the best overall one. But it doesn't let know you the sheer pounding force of it, or that you can almost climb right up to it. Do you see that ledge that the arrow is pointing at? We were walking on it. 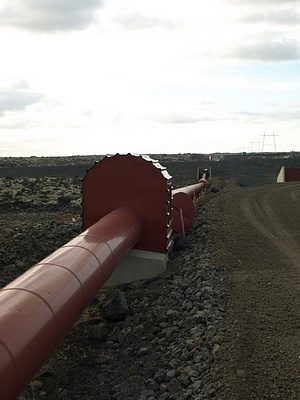 Iceland doesn't yet have North America's sheer paranoia about safety and lawsuits. The "safety" barrier is a rope about six inches off the ground, and we couldn't decide whether they were trying to say "past this point is unsafe for you" or "don't ruin our waterfall by making these rocks fall in with you". Either way, it is a very good attitude to have. 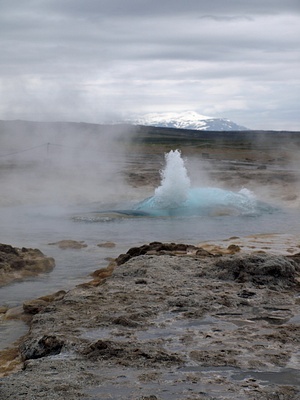 The Geysir area is a geo-thermal field where hot springs bubble and geysirs burst. Little geysir here mostly just spurts a bit now and then, but you can see the guide rope, it's name and the geysir - "go past this guiderope and you are stupid and deserve whatever you get" seems to be all they need. 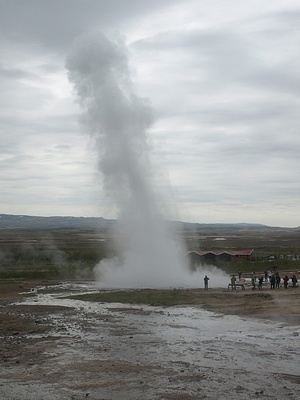 We spent some time on this geysir, trying to get just the right shot at it's moment of bursting. There's this strange luminescence in the water just as it bursts. This one is called Strokkur - it bursts pretty much every 5 minutes and is the largest in the field. 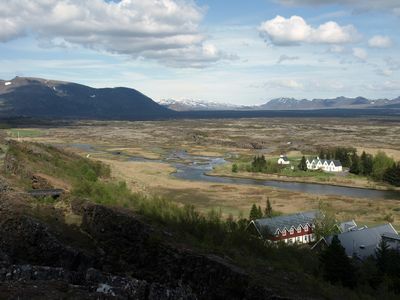 And last, but not least, Þingvellir National Park. We spent two days up there near the end of the week so details are below. Þingvellir is the place where the Viking Era Norse gathered every year to hold their Alþing - a central meeting where disputes were settled and laws made. Dinner was back in Reykjavik at a place called Ó, in the Hotel Óðinsvé. Absolutely delightful - multiple courses of unique appetizers and snacks, leading up to a light entree, and a kind of iced skyr for dessert. Sunday we went on the Saga Circle tour - which bored Karen quite a bit more than expected. It was a long trip in a cramped bus, with a guide alternating between "Scandinavian" (a mixture of Swedish and Norwegian) and English so seamlessly that Karen couldn't easily tell when to wake up and start listening again. Maybe it's just not a good idea to do two day long bus tours, one right after the other. Karen thought the tour would touch more on Viking Era stuff but apparently Saga stuff is something only sort of related. 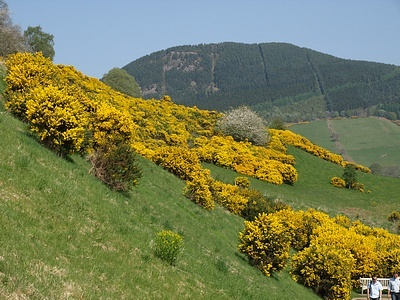 The tour takes you through the areas of Egill's saga, Gudmundr's saga Ormstongue, and snips from some others. It visits the graves of Egill, Skallagrim and others, including Snori himself. All the while the guide is explaining the sagas and the area around you. The Settlement Centre at Borgarnes is included. This is an audio tour through a few settings of background - pretty low content when done that way. Lunch was good though - traditional Icelandic meat soup. Reykholt has a museum for Snorri Sturlson which was mildly interesting and would have been more so if we were more interested in the 13th century. The tour also stops at a couple of waterfalls - Hraunfossar and Barnafoss - which were great. 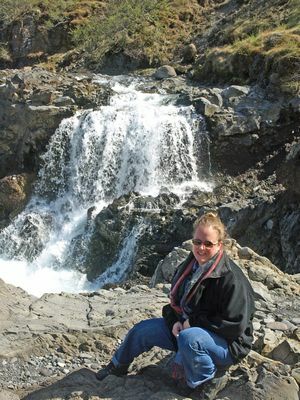 Neil enjoys this picture of Karen at Barnafoss. Barnafoss in english is "Childrens' Falls" and is so named because of a tale that is told about some children who died there. The guide didn't seem to believe the tale. 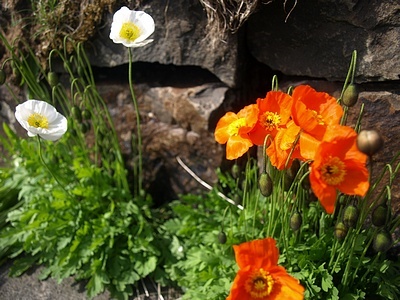 Karen enjoyed the icelandic poppies at Reykholt. 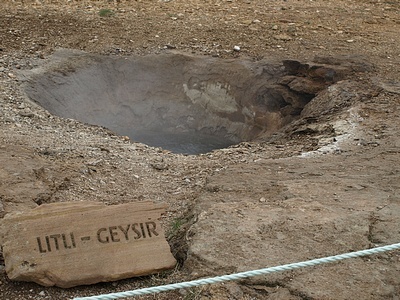 Deildartunguhver is the largest hot spring in the northern hemisphere. After dinner at a cozy little Italian place, we stopped at the sculpture garden near the guesthouse (Einar Jonsson Museum) to get some air. You have to love a country with lots of sculpture gardens. On Monday we rented a car from Odinn Car and did a little more looking around. 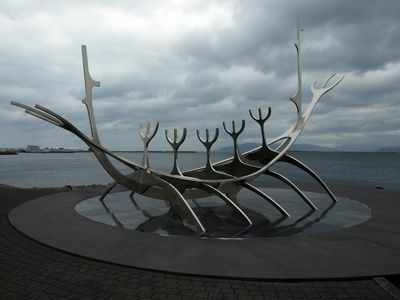 We visited the Boat Sculpture - perhaps the second most common photo of Reykjavik. 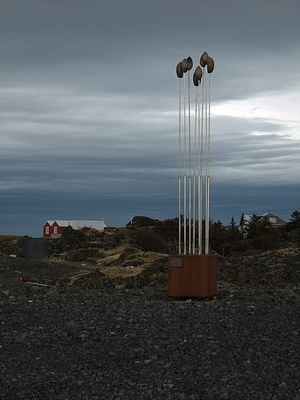 The sculpture is called Sólfar (Sun Traveller) by Jón Gunnar Árnason. The truth is that Reykjavik possibly has more art per square meter than people. It is hard to walk a block without seeing more art. We wandered along the shore past the site of the opera house-to-be, down to the harbour for Icelandic Fish and Chips, then around Tjörnin in the middle of the city to watch the birds. We walked past the Canadian embassy, walked through Ráðhús Reykjavíkur, saw an photographic art expo in city hall, took shots of the various birds on the city pond, wandered into some bookstores. The pond is called Tjörnin, and the house in it is..... yet more art. Went up to the Reykjavik Botanical Garden which was disappointing in May but lovely in September when Neil was last there. Then over to the Reykjavik Zoo which is a silly little zoo when you are used to things like the Metro Toronto Zoo but still lots of fun. Reindeer, sheep, goats, horses, cows, pigs, foxes, mink, rabbits, seals. All about helping the city families teach their kids about "wild" animals. We then finished with a trip to Kringlan mall because Karen really wanted to find some Icelandic clothing to take home, and wound up doing dinner at a restaurant in the mall. It was a low key day because Karen thought she was coming down with a cold. Then supper at the Viking Hotel which was pure schlock - but what would you expect? Food was fine although not particularily Viking Era documentable. The outfits were pretty bad, singing was pretty good but the guitars and acordian not exactly authentically Viking Era either. The pole axe was cute - using a sword to hit the poleaxe to keep the beat while you sing was odd. Decor was very amusing, some good, some bad. Would be fun to do with a group of Viking re-enactors like the Dark Ages Recreation Company, but less so as a couple for a night out. This is Ragnarr - his tag tells us his name and address - he lived next door. 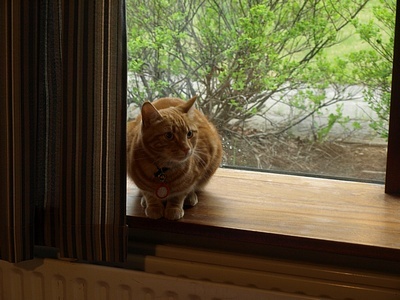 We opened the door to our room and found Ragnarr walking toward us. We assumed he'd gotten in via an open window (no European place to date seems to believe in screens) and couldn't find his way out so we escorted him out the door. A few hours later he was back at the window, wanting in. So we let him in and spent an hour or two watching him curl up on a bed and go to sleep. When we wanted to go to sleep we pushed him out into the cold world to find his way home - cruel, I know. Wednesday we visited the Asmundur Sveinsson sculpture museum near the zoo which was better than the one near the hotel. Closer to Neil's idea of art. We could stand to learn a lot from this city in terms of the proliferation of art and scultpture gardens and pools. Lunch at the Cafe Paris - reasonable food and prices. Before we left Reykjavik for Þingvellir and the ancient seat of government in the country, we stopped to take a picture of the modern version of the Alþing - the current seat of government. 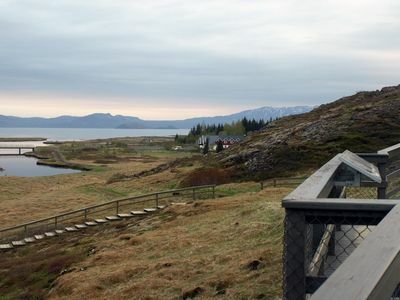 Then we were off to the Hotel Valhöll in Þingvellir - the only hotel in the park. The hotel is a little run down for the money but perfectly servicable and great food. 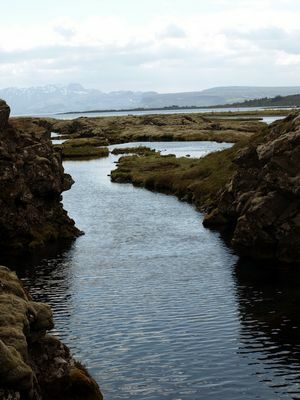 Spending a night in Þingvellir was suggested by a friend and we couldn't agree more. Being able to walk the park at night was a VERY cool thing. That is our hotel at the bottom right, and across way there are special guesthouses in which high government officials host special international guests, from the top of the cliffs. 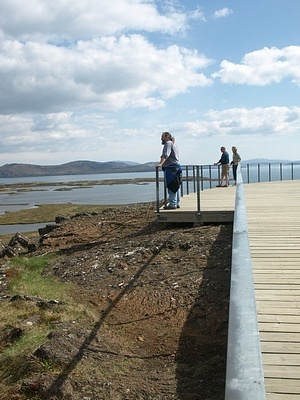 And this is part of Þingvellirvatn called Silfa, which Neil especially wanted to show Karen. 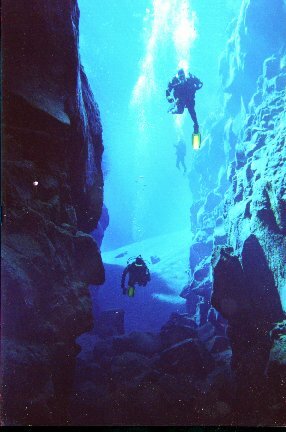 When Neil was in Iceland in 2000, he had the chance to dive here. The water is outstandingly clear and mind numbingly cold, being glacial meltwater that has spent a long time underground in the dark flowing out this far. Visibility can be over 100 metres (300 ft) - simply not to be believed when you are used to 13 metres (40 ft) on a good day. Have a look here for a photo from Neil's previous trip. 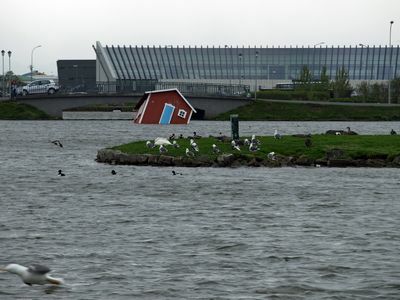 .... when a 6.1 scale earthquake hit near the town of Selfoss, only about 50 km away. We certainly felt it up there on the platform! Afterwards, the nice lady in the visitor centre wouldn't let us go back down the walkway on the continental divide for fear of falling rocks. Karen had been sitting directly under those cliffs just 15 minutes earlier. Good timing on that earthquake! Our hotel was at the bottom of the rifts. 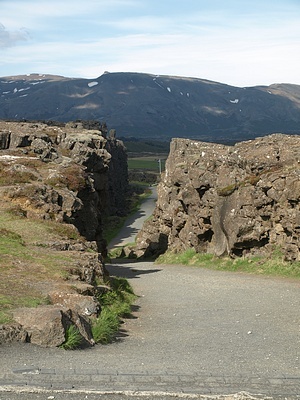 One of the Reykjavik Excursions tour buses gave us a lift back down via the roads that don't go through big rocks. We were a little shaken, but not stirred. Unlike the Silfa area, which was quite stirred up by falling rocks underwater and that beautiful clear diving water was muddified by the disturbances. It's a good thing there were no divers in the water at the time of the earthquake. Friday was our last day. We wandered around the park a bit more before we left, but they still didn't want us to go up the continential rift. We did get up to the center platform, where the national flag of Iceland is flown. 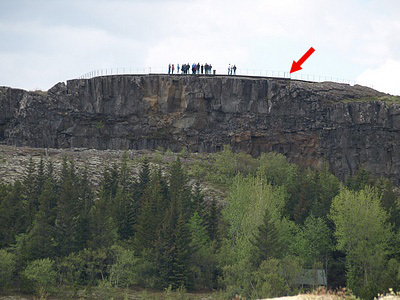 This area is considered to be the "law rock" - the center area of the ancient Alþing gathering. In this photo, Karen is looking back at the hotel in the distance. And Karen hunted more wildlife with her not big enough telephoto - good thing digital photos are so croppable in Photoshop. 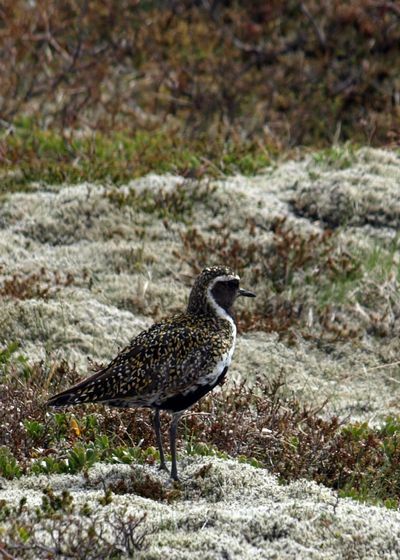 After hunting through several websites about birds in Iceland, we've discovered that this bird is the European Golden Plover. 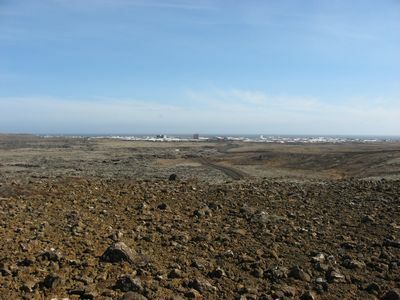 We drove back from Þingvellir to drop off the car in Reykjavik and then we took a Flybus to Keflavik via Blue Lagoon. A long hot soak in those wonderful sandy blue waters is a very civilized way to leave the country indeed. A few of the things we brought home with us - Neil's favourites from the trip. 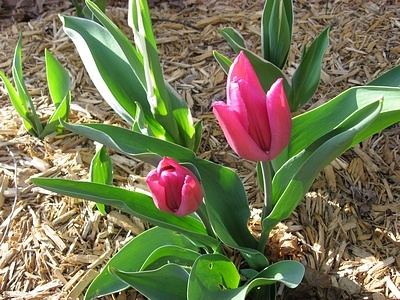 - Review the plan once over before you go for how that one major change affects everything else. We rented a car in Edinburgh, and returned it in Inverness. And rented a car in Orkney, and a new one in Shetland, because we weren't originally planning on going back to Edinburgh - we had wanted to take the ferry from Shetland to Iceland, and couldn't find a car company that would allow us to return the car in Shetland without exhorbitent cost. When the plan changed and we had to return to the mainland to take the plane from Glasgow to Iceland, we should have revisited the car plan. We could have rented in Edinburgh, and driven it all the way through across the ferries and back to return it in Glasgow easily! - If you're a big fan of historic sites in Scotland, consider joining the Historic Friends association. It gets you a quarterly magazine, free admission to many sites, discounts on others, and a discount in all of their souvenir shops - well worth the price. - We missed a few things that we had hoped to see on the trip, but we don't regret that. Neil feels that it's better to have too many plans then not having enough and finding onself at too many loose ends. It's okay to let things go - for whatever reason is needed at the time - because then your trip will leave you wanting more and willing to come back again. Any good performer knows the value of that adage!